Many seniors stop reading as they grow older because of cognitive issues, vision impairment, or a lack of interest. If you have an aging loved one who has recently stopped reading, it might be time to help him or her get back into this healthy and stimulating habit. Here’s a quick look at five reasons seniors should continue to read past the age of 65. Reading a novel might not seem like a good way to challenge critical thinking skills, but studies have shown that reading for a few minutes a day can have a positive impact on cognitive health. A long-term study carried out at the University of Michigan revealed that reading for 3.5 hours per week can boost cognitive health. While more research is needed on the subject, some experts believe reading can delay or minimize the symptoms of dementia as well. Sleep disorders are very common among the elderly, and having a sleep deficit can affect physical and mental health. Many older adults sit in front of the television for hours before going to bed, which can impact the quality of sleep they get. Reading a few pages of a good book triggers the production of serotonin, dopamine, and other natural chemicals that help seniors sleep. For seniors with health limitations such as severe arthritis or diminished eyesight that make it difficult to read printed books, listening to audiobooks can be enjoyable. Aging in place can present a few unique challenges for older adults. Some only require part-time assistance with exercise or meal preparation, while others are living with serious illnesses and benefit more significantly from receiving live-in care. Montgomery, AL, Home Care Assistance are leaders in the elderly in-home care industry for good reason. We tailor our care plans based on each senior’s individual needs, our caregivers continue to receive updated training in senior care as new developments arise, and we also offer comprehensive care for seniors with Alzheimer’s, dementia, and Parkinson’s. Chronic stress is another serious issue many older adults face. When left untreated, anxiety suppresses the immune system and increases the risk of cardiovascular conditions. Getting lost in a great novel is an excellent way to boost happiness and lower stress levels. To maximize the benefits of reading, seniors should try to sit down with a book for at least 30 minutes a day. They also need to avoid distractions like television shows and loud music. 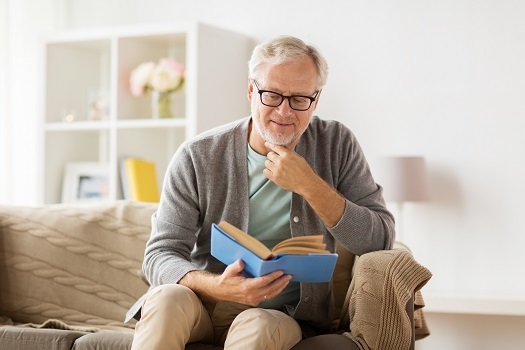 Memory naturally decreases as seniors grow older, but they can do quite a bit to preserve their mental faculties, including engaging in stimulating activities such as reading a book. When reading, multiple areas of the brain are used at the same time, which is good for short-term and long-term memory. In addition to reading novels, seniors should also consider picking up textbooks, thought-provoking magazines, and industry journals. A professional caregiver with training and expertise in methods of cognitive stimulation can also help your loved one strengthen memory skills. Not every senior has the same care needs, which means they don’t all need the same type of senior care. Montgomery families can rely on Home Care Assistance to provide individualized care plans to meet your elderly loved one’s unique care needs. Our holistic Balanced Care Method was designed to help seniors focus on healthy lifestyle habits such as eating nutritious foods, exercising regularly, and maintaining strong social ties, and our Cognitive Therapeutics Method offers mentally stimulating activities that can stave off cognitive decline and delay the onset of dementia. Increasing empathy can be a very difficult task, and many people never even consider how others are feeling. To become more empathetic, seniors should constantly expose themselves to new beliefs and situations. One of the best ways to become exposed to different perspectives is to read diverse books by a wide variety of authors. Learning how to empathize with others might even provide a more positive outlook on life. Mentally engaging activities such as reading help seniors boost their mental and emotional wellbeing. Living alone at home in the golden years can present a few unique challenges. Trust Montgomery senior home care professionals to help your senior loved one maintain a higher quality of life while he or she manages an illness and performs the daily tasks of living. Reach out to us at Home Care Assistance if you need compassionate, professional care for your loved one. Call us at (334) 593-3988 today to talk to one of our compassionate Care Managers about our high-quality home care services.